Norfolk Southern Implements Massive Buyback Program. Is That the Right Move Today? Management has bought back more than $2.3 billion in stock in 2018 thus far. The railroad industry has had a great run over the past few years as industrial activity has ticked up and a constrained trucking market is sending more shipping containers to rail. No other company's results exemplify this change quite as well as Norfolk Southern (NYSE:NSC), which is posting record-smashing results. 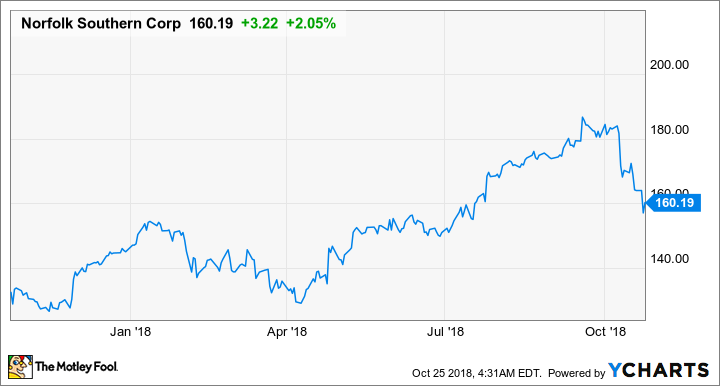 This past quarter, management felt so good about the progress it has made improving operations and the outlook for its business that it announced an accelerated buyback plan that purchased billions in stock in a few months. With the industry riding epic highs right now, is this the best use of capital? Let's take a look at the company's most recent earnings results and see whether management may be overly optimistic with this buyback program. Data source: Norfolk Southern earnings relese. EPS= Earnings per share. This was another great quarter for the east coast rail company. After posting a second quarter that blew by all-time records, the company followed up with its best-ever third quarter. While operating income slipped slightly from higher fuel prices and some equipment rental, the company was able to make up for it on earnings per share because it bought back gobs of stock in the quarter. It bought back $1.2 billion from two financial institutions in August as part of an accelerated share repurchase program, which totaled about 5.7 million shares. The real shining star in this quarter's results was its intermodal segment, which grew by an incredible 20%. The railroad industry, in general, is benefiting immensely from an incredibly tight trucking market and recent regulations related to electronic logging devices in long-haul trucks. Now that truckers' hours logs are electronic instead of by paper, it's harder for shippers to get creative with hourly logs to move containers long distances. So customers that want to move goods over long distances can benefit on both cost and time by moving to rail. Data source: Norfolk Southern earnings release. Chart by author. What's also encouraging is that additional volumes aren't impacting operations, as management noted that its operating ratio of 65.4% is the best third-quarter result in the company's history. Train speeds are up, fuel efficiency is improving, and terminal dwell times are all down. While a 65.4% operating ratio is by no means a great result compared to others in this industry, it is a vast improvement on prior years and has helped to drive better operating income results. On Norfolk Southern's conference call, CEO James Squires discussed the progress management has made on its strategic plan it implemented a few years ago and where he sees the company headed from here. Guided by the strategic plan we announced in late 2015, thanks to the hard work of our management team and employees we have consistently achieved the results we promise shareholders. This year we are on track for another year of OR improvement and strong bottom line growth and we are confident we will make further progress next year and beyond. In the last few months, we have begun overhauling our railroad from top to bottom, leaving no stone unturned in the quest for efficiency, growth, and shareholder value. As we revamp how we operate, we will listen to our customers and find new ways of meeting their needs. We will use our knowledge of our company to innovate from within. We will bring in outsiders where they have experience or skills we lack. We will collaborate with our supply chain partners and others to learn their best practices and, yes, as you just heard from Mike, we will implement PSR principles where they lead to a better result for customers and shareholders. All of the above, we are open to all good ideas that will advance customer service and shareholder value regardless of the source. For those scoring at home, PSR stands for Precision Railroad Scheduling, it is a system that emphasizes trains departing at exact times rather than holding trains for full train loading. It is an operational method implemented originally by Hunter Harrison during his time at Canadian National Railway, which has subsequently been implemented at Canadian Pacific, CSX, and now Union Pacific and Norfolk Southern are getting in on the game, too. Considering that the Canadian rail companies have consistently outpaced their American peers in terms of operating ratio, it's not that surprising that the rest are now jumping on board with the change. NSC price change. Data source: YCharts. Best time to use the balance sheet to boost returns? If there was one thing that investors might want to be concerned about, it's that Norfolk Southern's management is getting incredibly aggressive with its share repurchase program, and using the balance sheet to cover it. So far in 2018, the company has bought back $2.3 billion in stock and issued $2 billion in debt to cover a large portion of it. Looking at the company's stock, you can see why management wants to be aggressive with its buyback program right now. Its shares trade for 7.8 times earnings despite the fact that the company has blown past analyst expectations for the past five straight quarters. It looks cheap, and buying a stock when it is cheap is the best way for management to get a rate of return on buybacks. That said, we are in a part of the cycle where the company may be better off lowering its debt load instead of significantly adding to it. Railroad companies are posting record results across the board thanks to robust economic growth and those trucking issues mentioned above. The concern is that if growth flattens out, it could be left with an unnecessarily large debt load to deal with. That said, management does deserve some credit for delivering record earnings and maintaining its best operating ratio ever recorded. The fact that Norfolk Southern has been able to do this should make investors more interested in its stock.